The round tower is probably C12. The nave and aisles are C13 and C14, as was the original chancel, which was incorporated into the nave when the church was altered in 1748. 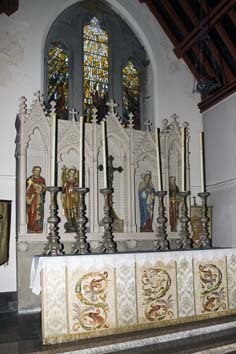 The present short chancel was added in the C19. 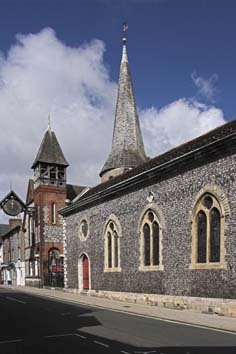 St Michael’s is the most centrally located parish church in the town and incorporates the lost parishes of St Martin and St Andrew. 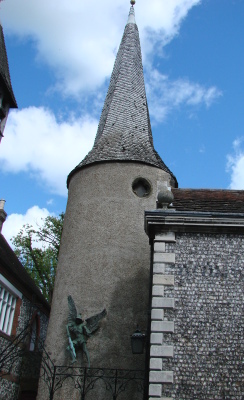 Presumably to differentiate itself from St Michael, South Malling, which is now within the town boundary, it is today often referred to as St Michael-in-Lewes. Godfrey (1 p121) and the VCH (7 p38) date the round west tower to the C13 because of a lancet, renewed in the C19, and the pointed tower arch with just a single roll-moulding, though that too has been renewed. The VCH cites a second west lancet, no longer visible. However, any old external detail is hidden by pebble-dash and the other round towers in the Ouse valley (Southease and Piddinghoe) are C12. This seems preferable, though this one could be the latest of the three; the various pointed heads would be compatible with a late C12 date. The quatrefoil-shaped bell-openings are probably alterations of the C14. This may also be the date of the shingled spire, the lower part of which is round and the upper octagonal. On the east side of the tower is the higher line of an earlier nave roof and S Hart suggests the tower may also have been higher (p163), though this is open to doubt. 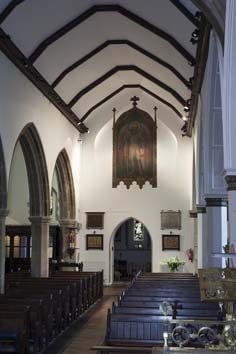 The nave to which it was attached had C13 lean-to aisles with west lancets, as the visible original roof-line of the south aisle shows; the lancet in the south aisle is open, but is mostly renewed. Both rere-arches have scoinsons, suggesting a date well into the C13. However, the octagonal piers and arches with two hollow chamfers of the first three bays of the south arcade from the west are C14, suggesting the aisle was rebuilt then. This is odd, as it could not have been widened because of the line of the street. The chancel may also have been rebuilt, for a C14 arch across the nave at the east end of the C14 part of the arcade is the former chancel arch, though it may have been altered or reset in the C18. It has a moulded head and dies into the wall on each side. Of the mediaeval north aisle little more than the groundplan survives. Sir Stephen Glynne’s description in 1826 of a low north arcade with plain round piers (SNQ 16 (May 1964) p 97) must be an error, as the quite different existing arcade dates from 1748 (see below). The Sharpe Collection drawing (1803-04?) shows a low aisle with mullioned windows and two tiers of dormers, suggesting that there could have been more than one tier of galleries. These would have been reached by a lean-to structure against the north side of the tower containing a stair. A higher gabled structure to the east with long windows like those originally on the south side also looks C18. In 1748 the church was said to be ruinous (Brent: Georgian Lewes p108) and in that year a thorough remodelling was begun. The intention was to create a rectangular church suited to preaching. To this end the south aisle was extended by two bays south of the chancel. These are superficially like the C14 one, but of timber. Differences include the panelled soffits of the arches and the construction of the piers which consist of massive oak posts inside a decorative skin (2 ibid). The external wall of the south aisle was heightened and faced in carefully squared flintwork with dressings of Portland stone. The original intention was to use brick, but none of sufficient quality could be found (Clarke papers). The symmetrical front thus created is rusticated with ball-finials at the ends, four centred doorways at each end beneath quatrefoils and bears the date 1748. Adelaide Tracy (1855) (III p94) shows the windows with simple Y-tracery and there was a three-light east window, though the chancel did not project (Quartermain (E) p167). The design was submitted by J Daw (ESRO Par 414/9/1/2), who also did the work. The entire north arcade was replaced and now resembles the new part of the south one, though the aisle was not heightened; the higher structure to the east could be a reconstructed north chapel or entirely new. The church as it stood after this work was modified in 1828 by the addition of a north gallery by J Cowper (ICBS). A watercolour of c1864, of which a copy is on display in the church, shows the east end with three level gables, each above a window like those on the south side of the aisle, though the centre one one has three lights. Adelaide Tracy and the Sharpe drawing show small houses built on to the tower. One to the south had a projecting clock (like the C19 one now on an adjacent building) and is sometimes called a bell-tower (2 p121). It may have lasted until a faculty was granted in 1897 to open a west doorway in the south aisle (WSRO Ep II/27/186), which had been blocked by the house. This was after Philip Currey had in 1877-78 restored the tower (having already repaired the spire) and added a low chancel (BN 34 p436). The C18 arcades and south aisle were unaltered, except for the insertion of heavy plate tracery into the windows, including both east ones, and the plastered roofs were left. 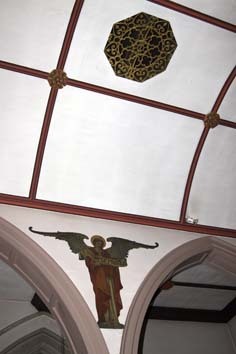 A reported restoration of the chancel by J L Pearson in 1884 (BN 47 p364) must result from confusion with his reredos (see below), installed a year earlier (BN 45 p1002) and a report of an enlargement said to have taken place in 1885 (KD 1899) appears equally erroneous, though the amount stated to have been spent (£3060) may refer back to Currey’s work. There were repairs in 1982 by Carden and Godfrey (ICBS). This was the year that W E Godfrey died and the superintending architect was N McFadyen. 1. Headless figure in armour of c1420, assigned to the B Series (see London workshops). 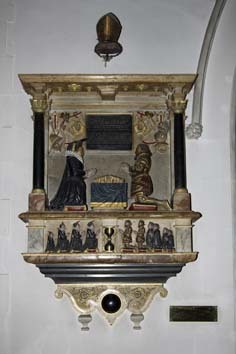 The arms in the top left corner suggest he was a de Warrenne (Mosse p107), though the direct line had died out. A swan (previously wrongly identified as a pelican) on the armour has been linked to the House of Lancaster (3 p260). The man commemorated may be John Waryne (sic), who was in the household of Queen Joan of Navarre, wife of Henry IV (ibid p261). 2. John Braydford, Rector (d1457). 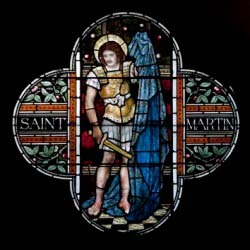 A half-figure, vested for mass, above the inscription. Font: Round and C19, with trefoiled arcading on the bowl and small shafts. 1. (North chancel window) C E Clutterbuck, 1862 and very worn. 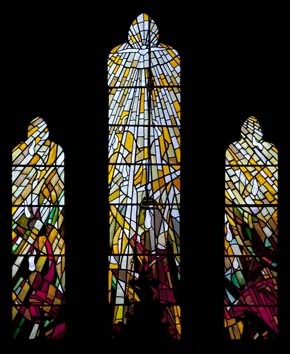 It must have been reset after the chancel was added (2 lights with Virgin and Child and Crucifixion) (B 20 p321). 2. 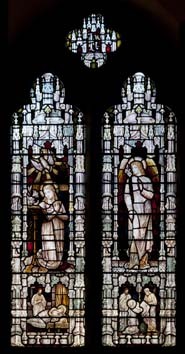 (South aisle, including quatrefoils and chancel) A fine sequence of windows by J Powell and Sons in pre-Raphaelite idiom, inserted between 1880 and 1890 and ending with the Annunciation (CDK 1890 pt 2 p156). 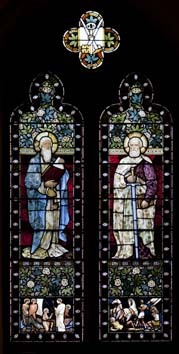 The designer was H Holiday (Hadley list), though J W Brown may have been involved in some of the chancel glass (ibid). 3. (North aisle, first and third windows) J Powell and Sons, 1907, designed by F Mann and 1930, designed by H S Hodges (both Hadley list). 4. (East window) Posthumous work by M Douglas Thompson, 1997 (www.stainedglassrecords.org retrieved 11/3/2013) in place of a badly faded one of 1878 by J Powell and Sons. It depicts the coming of the Holy Spirit at Pentecost. 2. (North aisle) Gideon Mantell (d1853). Plain brass tablet to the discoverer of the iguanodon. From the date it could just be a work of J Holman or a younger member of his family. 3. (South aisle) Captain Charles Rand (c1812), who died at Bangalore. It consists of a tablet with a triangular pediment by M Crake (Roscoe p321). Painting: (West end) Descent from the Cross by A Bellucci (attributed) (BE(E) p512). 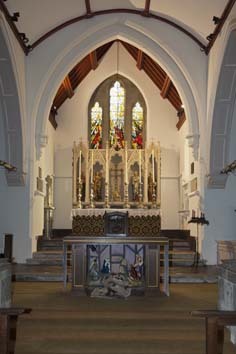 Reredos: 1884 by J L Pearson (see above). Though quite tall, it is spiky and fairly ordinary. The painting of the statues, if not the statues themselves, is likely to be later. 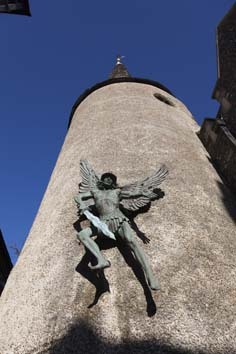 Sculpture: (Outside on south side of tower) St Michael, H Phillips, 1976 (S Hart p163) and made mostly of fibreglass. My thanks to Nick Wiseman for the photographs of the interior, the fittings and all but the tower outside.